A big part of travel is that feeling you get when experiencing something completely new, something you haven't seen or done before. Many travel destinations offer an amenity or two that other places don't but there are only a few locations in the world that offer a truly unique experience. Some of these places are wonders of nature a spot where the flora or fauna can't be found elsewhere, or where the mountains stretch the landscape to impressive formations. Other destinations are unique because of man-made features entire islands created out of sand, underwater museums designed to decay, or hotels shaved from ice. More than just spectacular scenery, Jiuzhai Valley National Park is home to nine Tibetan villages, over 220 bird species as well as a number of endangered plant and animal species, including the giant panda, Sichuan golden monkey, the Sichuan takin and numerous orchids and rhododendrons. 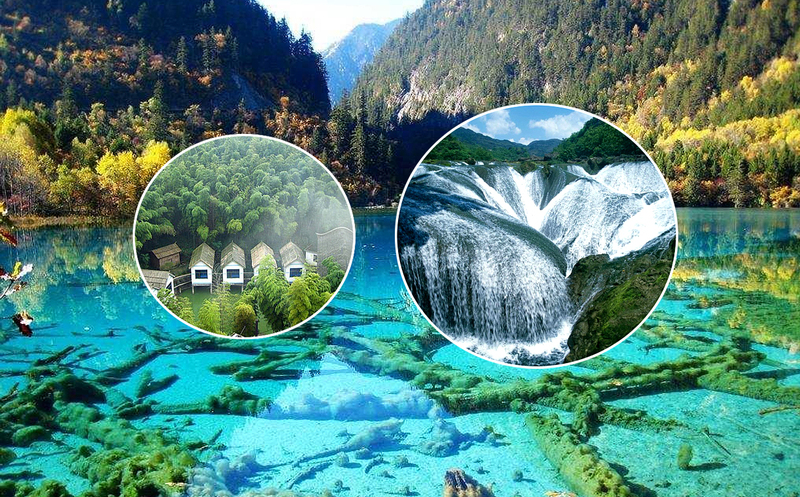 Jiuzhai Valley is locally known as Jiuzhaigou (Chinese for "Nine Village Valley"). It is a national park located in the Min Shan mountain range, Northern Sichuan in South Western China. It is best known for its fabled blue and green lakes, spectacular waterfalls, narrow conic karst land forms and its unique wildlife. It was declared a UNESCO World Heritage Site in 1992; the park joined the Man and Biosphere Conservation Network in 1997 and has also received IUCN and ISO 14,001 accreditations. It is China’s premier national park and is located at elevations ranging between 1,990m (6,529 feet) to 4,764m (15,630 feet) above sea level. Located on the edge of the Tibetan Himalayan Plateau in Northern Sichuan Province it is easily accessible by direct flights from Beijing, Shanghai, Xian, Chengdu, Chongqing and Hangzhou. Jiuzhai Valley provides spectacular scenery throughout the year making it one of China’s most treasured scenic sites. One of the most precious, protected places in the world. A visit here offers the chance to experience the spectacular Canadian Rocky Mountains and glacier-fed lakes, wildlife at its wildest and small-town charm that only Banff can offer. Start planning your trip today. Officially named Puerto Jose Banus, after the architect who designed the town, Puerto Banús is known as Costa del Sol's playground for the rich and wealthy that come here for the beaches, the beach clubs and the buzzing nightlife. The shops and restaurants reflect this expensive lifestyle, with plenty of designer names on offer around the marina. If you enjoy people-watching and are there during the summer months you'll never be short of popstars or reality TV stars to spot. If sports cars and big boats are more your thing, don't worry, there are plenty of Ferraris and luxury yachts to admire. Explore our Puerto Banus section to find out more about the town and what there is to do!